An atmosphere of insecurity and fear is being created simultaneously in several countries in a global public health initiative under the auspices of the WHO. We are summarising selected reports on body bags, mass graves and quarantine orders. Swine flu is acknowledged to be milder than seasonal influenza. So what is the purpose of these initiatives? There is a consistent pattern. These reports raise serious questions as to the public health objectives of our governments, not to mention the WHO. The entire construct is politically motivated and corrupt . It serves the financial interests of the pharmaceutical industry. It justifies the militarization of public health and violates fundamental civil liberties. “The grim revelation will see the mass burial sites dug in advance to cope with any potential crisis. The Government is planning to create a series of communal graves to cope with the second outbreak expected in the autumn and through the winter. 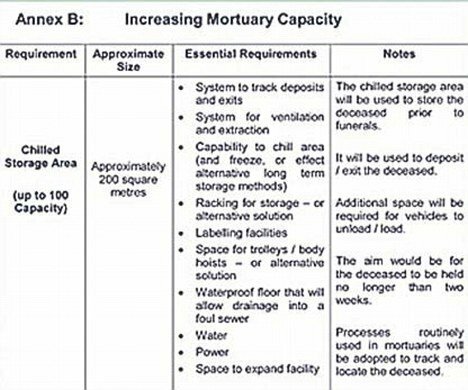 A Home Office document published earlier this year sets out plans for how local councils should deal with a high death toll – estimates of the number of deaths range from 55,000 to as high as 750,000 from the H1N1 killer virus – including setting up temporary mortuaries. The following Report was released at the very outset of the crisis in Mexico by CBS News regarding the implementation of nationwide quarantines. The U.S. Department of Homeland Security has sent a memo to some health care providers noting procedures to be followed if the swine flu outbreak eventually makes quarantines necessary. McGaw appears to have been referring to the section of federal law that allows the Surgeon General to detain and quarantine Americans “reasonably believed to be infected” with a communicable disease. A Centers for Disease Control official said on Tuesday that swine flu deaths in the U.S. are likely. Federal quarantine authority is limited to diseases listed in presidential executive orders; President Bush added “novel” forms of influenza with the potential to create pandemics in Executive Order 13375. Anyone violating a quarantine order can be punished by a $250,000 fine and a one-year prison term. 1. Terms of confinement. You are ordered to remain at the quarantine facility, _____________________ [insert name and address of facility], from ___________ to ____________ [insert dates of quarantine]. 4. Legal authority. This order is issued pursuant to the legal authority contained at Iowa Code chapters 135, 139A and 641 Iowa Administrative Code chapter 1, a copy of which is labeled Attachment B and is attached to this order for your review. The Department shall comply with the principles for quarantine contained in subrule 1.9(3) of this attachment when issuing and implementing this order. 5. Ensuring compliance. In order to ensure that you strictly comply with this Quarantine Order the Department or persons authorized by the Department may regularly inspect the quarantine facility. This is an official document of the Iowa State government, which has also been endorsed by the Centre for Disease Control (CDC). If it were a preliminary or internal draft, it would not have been published by the CDC. The question is whether similar quarantine procedures are being replicated in other states across America. “The proposal is awaiting final approval from Defense Secretary Robert Gates. The officials would not be identified because the proposal from U.S. Northern Command’s Gen. Victor Renuart has not been approved by the secretary. The plan calls for military task forces to work in conjunction with the Federal Emergency Management Agency. There is no final decision on how the military effort would be manned, but one source said it would likely include personnel from all branches of the military. It has yet to be determined how many troops would be needed and whether they would come from the active duty or the National Guard and Reserve forces. Civilian authorities would lead any relief efforts in the event of a major outbreak, the official said. The military, as they would for a natural disaster or other significant emergency situation, could provide support and fulfill any tasks that civilian authorities could not, such as air transport or testing of large numbers of viral samples from infected patients. As a first step, Gates is being asked to sign a so-called “execution order” that would authorize the military to begin to conduct the detailed planning to execute the proposed plan.